This recipe for Mango Glazed Chicken. Yes, let’s finally address the recipe on the page. 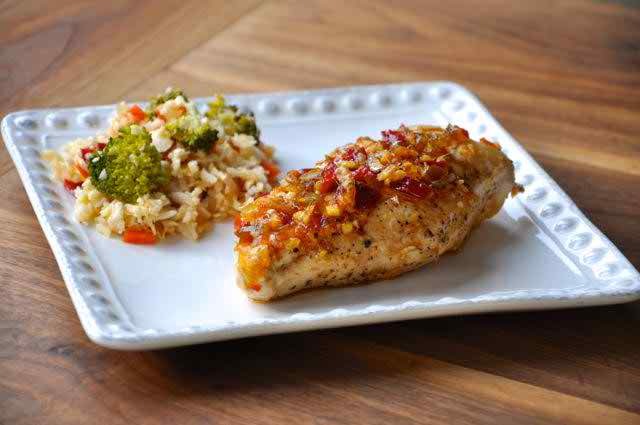 Is a fantastic weeknight dinner recipe that’s packed with tangy, delicious and spicy flavor that really revs up your taste buds. The kids devoured this one too, so that’s a nice bonus! And Serve with a side of pea’s rice mixed with fried polao. First combine all of the Mango Glaze ingredients in a small bowl. And mix well. Then rinse the chicken breasts and pat dry. Generously season with sea salt and black pepper. Now place the coconut oil in a large skillet over high heat. Add the chicken breasts and cook until golden, about 5 minutes per side. Pour the Mango Glaze over the chicken breasts and reduce the heat to medium-low and simmer, covered for about 15 minutes, stirring the sauce and occasionally flipping the chicken, until fully cooked. An instant-read thermometer inserted into the thickest part of the chicken should register 165 degrees. Finally serve with the Mango Glaze and a side of fried rice.